Can Americans Raise the Flag in Aztlan (Chicano Park)? Patriot Picnic II has been scheduled for Chicano Park in San Diego at 10am on February 3, 2018 by an anonymous organizer. The issue to be tested, is whether Americans still have their constitutional rights in this 7.9 acre supposedly public park, which the Chicano Park Steering Committee calls the first part of Aztlan to be conquered. In particular, the American flag will be raised in Chicano Park that day. The American Southwest “Aztlan” is claimed to be their national homeland and portrayed as a separate nation. The park is essentially a no-go zone for overtly pro-Americans and the police. The City has ceded ownership of what they call the “ombligo” (navel) de Aztlan to the Chicano ultra-nationalists. City officials pretend to control the property, but the Chicano Park Steering Committee has a paramilitary group, the Brown Berets of Aztlan, which, under orders of the Steering Committee, actually controls the park with the help of allied extreme left organizations, as the first part of American territory to be lost in 240 years. It’s called the “Ombligo” (navel) of Aztlan, because the idea is that their Chicano national homeland will grow from this small beginning in Chicano Park led by a new “mixed” master race of brown people. This is a racial and ethnic, ultra nationalist concept. The Park is also about socialism. Since their ideology is a mixture of Chicano ultra nationalism and communism, this blogger calls it Chicano national socialism or La Raza national socialism. The Chicano ideology is based on the “La Raza” concept that the ultimate mestizo (mixed) race will arise from the Hispanic world. The supporters of the Park also act in an intolerant way, like national socialists. Last September 3rd, a small group of pro-Americans were chased out of of this Park by a threatening mob of angry park supporters, merely because they wanted to visit the park, have lunch and view the anti-American murals. The park supporters lied, saying the five visitors were there to vandalize the murals, slandering the visitors as “white supremacists,” “racists” and “Nazis” in order to whip up the crowd into a lynch-mob mentality. Here is video of that previous event. This event is not against Mexican-Americans or Hispanic Americans, though the radicals (maybe on both sides) will try to make it out to seem that way. Hispanic patriots will be with us flying the flag on this day in Chicano Park. Everyone is invited to bring a flag and participate in a celebration of American unity. We realize very well that there are plenty of patriotic residents of Barrio Logan. We would be very pleased to have our Hispanic brothers join us in order to help prevent any violence from occurring. “My worst enemies were not the anglos, but those hispanic Americans, who had chosen the “American Way of Life”…. 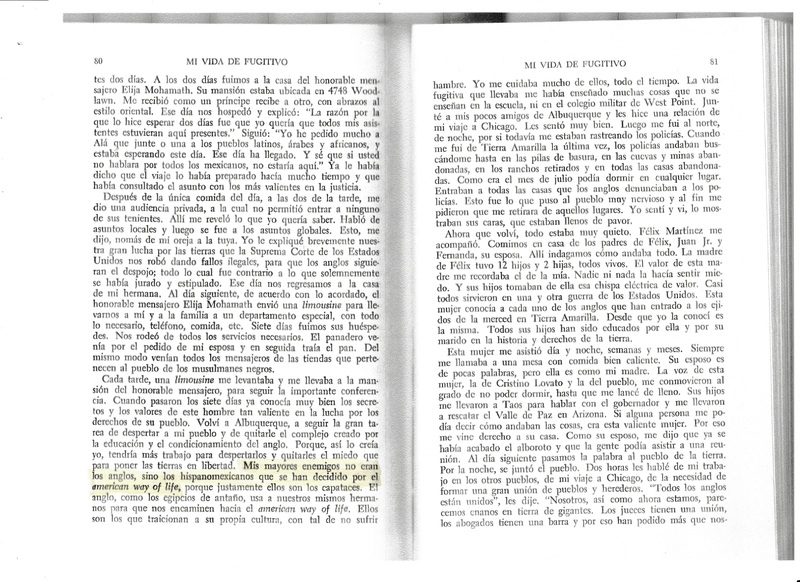 Mi Lucha por la tierra, Reies Lopez Tijerina, p. 80, paperback edition. See the scanned page from the book here. Tijerina’s object was not to bring people together but to keep them resentful and separated. Unfortunately, that is also the purpose of the radical Chicano Park and many of its most passionate supporters. Among other acts of violence, two Hispanic law enforcement officials (vendidos), who supported the American system, were killed in the 1960’s by Tijerina’s militants in northern New Mexico. Tijerina was diagnosed in prison as a psychopath.